That’s right. Through April 30th, 2019 we have the great Larceny Wheated Bourgon (1.75ML) on sale, and we’re giving away a bottle of Dolin Vermouth Rouge (375ml) with your purchase, all to convince you to learn how to make the perfect 212 Manhattan. 212 is an iconic area code for Manhattan, and it’s an easy way to remember the quantities for one perfectly made Manhattan. Cheers to Larceny – and to never forgetting how to make a Manhattan again! This entry was posted in Learn About Spirits and tagged 212, bourbon, larceny, manhattan, wheated, wheated bourbon on April 17, 2019 by bottlesfinewine. They’re two of our region’s most celebrated holidays, two that we look forward to all year. And even if you don’t honor the traditional Easter or Passover rituals, there’s lots to toast to this weekend. Spring has sprung, and our markets are bursting with the new season’s first produce. Here’s what our team recommends to accompany all spring occasions. Whatever you may celebrate – we hope you do so with great wine, family and friends. Chag Pesach! Happy Easter! Happy Spring! This entry was posted in Wine Pairings and tagged easter, kosher, Rosé, spring on April 17, 2019 by bottlesfinewine. Even though the weather can’t make up its mind about what season we’re in, we’re drinking like it’s winter. Because we live in New England. And it’s February. And winter foods make such great wine partners. Here are the new bottles our wine Manager Kate brought in to pair with Taco Tuesdays, winter feasts, and everything in between. This entry was posted in Other and tagged wine, wine pairing, winter on February 13, 2019 by bottlesfinewine. That’s what it’ll feel like when you taste the 3 bottles we’ve selected as this year’s top value sparklers. They deliver so much quality, flavor and enjoyment for what you pay that you’ll feel as if you’ve stolen them right off our shelves. Cheers to you and yours, whatever you may celebrate! This entry was posted in Learn About Wine, Other and tagged bohigas, bubbles, cava, french, granddad, Prosecco, sparkle, sparkler on December 11, 2018 by bottlesfinewine. There’s only so many times you can get them the same old, same old. Surprise and delight the beer and spirits lovers on your list this year with a variation on their favorite theme. It’s the gift that keeps on giving. Beer newbies and long-time aficionados alike will be thrilled with each month’s package of 3 unique beers accompanied by detailed tasting notes, pairing recommendations and a recipe. Visit here to find out more. 3-Month membership starts at $88+tax. 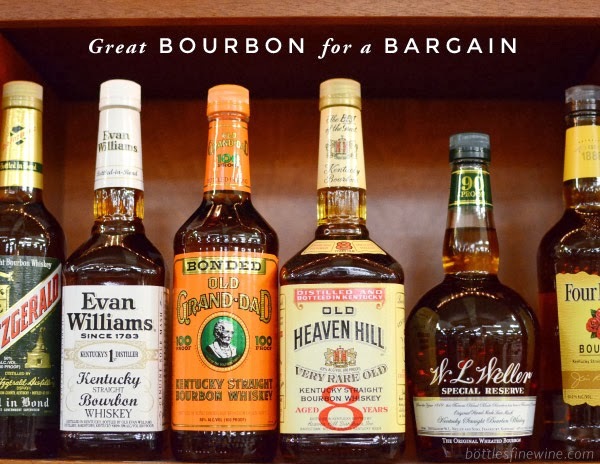 You can’t buy them anywhere other than at Bottles, which means you really can get the bourbon-lover-who-has-everything something they’ve never had before. And you can do so without breaking the bank: our Private Barrel Selection starts at $34.99. Call or visit for current inventory. Maker’s Mark as shown, $74.99. Give them the ultimate gift – the gift of choice. Our sister bar The East End on Wickenden Street in Providence has over 300 whiskeys, all available by dram and pour. A gift certificate in any denomination you choose means they can select the bottles they want to taste – all paired to the restaurant’s award-winning cuisine. Call (401) 433-9770 or visit The East End online. And if you still haven’t found what you’re looking for, come on in or give us a jingle and our team of passionate, in-the-know beer & spirits buyers will help you select the perfect, tasty gift. This entry was posted in Gift Ideas, Other and tagged christmas, gift on December 4, 2018 by bottlesfinewine. There’s no better way to enhance your wine knowledge and expand your culinary palate than through first-hand experiences in the regions most known for their outstanding gastronomic cultures. Our travel to Italy — and closer to home, the North Fork of Long Island — will allow you live like a local with insider access to the wineries, award-winning restaurants, farms and kitchens that lend each region its world-class status. During each trip we’ll explore the local food and wine scenes via hands-on, private experiences available only through us. This is small-group travel, filled with behind-the-scenes activities and tastings with leading winemakers, chefs, food artisans and farmers who contribute greatly to each region’s tradition. Click on each experience below to download our brochure, complete with all details on each trip, including accommodations, inclusions and pricing, and how to make your reservations. We hope you can join us – Cheers! This entry was posted in Vineyard Tours and tagged long island, north fork, tour, travel, trip on November 27, 2018 by bottlesfinewine. What’s better than their favorite wine? A basket filled with it. Have a team member build your basket today or visit here for inspiration here As shown: $43.00. Give them an unforgettable experience with this Bottles-led, luxurious, 4-day insider’s trip to the famed North Fork of Long Island Wine Country. They’ll enjoy VIP-status, dinners with winemakers, hands-on experiences and behind-the-scenes tastings. Download our brochure here for complete details on the trip, including accommodations, inclusions, and pricing, and to make your reservation. Still haven’t found what you’re looking for? We have thousands of bottles in store, and in-the-know team members to help you select the perfect gift. Come on in – we’d love to help you! This entry was posted in Other on November 27, 2018 by bottlesfinewine. For all you beer and cider lovers out there, here’s a mix of styles – some light and crisp, others rich and creamy – that are great this time of year. Whatever you’re eating on Thanksgiving, the bottles listed were made for sipping alongside the most anticipated meal of the year. An American take on a traditional Belgian brew. Crisp, clean and hints of oranges and coriander. The citrus notes will pair beautifully with your savory bird and the tart cranberry sauce. This stout is brewed with “a ridiculous amount of barley” and aged in oak barrels with real vanilla beans. Rich, complex and roasty – this deep, dark selection from Dogfish is a perfect replacement for dessert, or will complement a warm apple pie with vanilla ice cream! It’s Worth. Every. Single. Penny. This dry, still sidra (Spanish cider) is a great introduction to the style. It’s a traditional, funky cider that is fermented in chestnut barrels and unfiltered (so the floaters are to be expected!). It’s slightly sour, so I recommend opening this bad boy with the sage stuffing or the cheese and crackers you’ll pick at before the turkey timer goes off. A thirst-quenching mix of vanilla and star fruit flavor. This originally-tart cider is aged through the winter in whiskey barrels, bringing the once-sour apples to a calm, warm, mapley finish. Dangerously delicious and a knockout when had with the sweet potatoes or butternut squash laden with brown sugar and butter. This entry was posted in Other on November 13, 2018 by bottlesfinewine. One of the things we’re most proud of at Bottles is our ever-growing selection of private single casks of bourbons, ryes and malts. Hand-selected by our team, they bear the Bottles stamp of approval for taste, quality and distinctiveness. They are truly one-of-a-kind, and are available only in limited quantities, and only to our loyal whiskey-loving community. Herewith, our latest arrivals. Come check them out in store before they’re gone. If you’d like to sip before you shop, visit our sister bar The East End where they’ll be on the menu, while supplies last. It’s always difficult to select a barrel from Four Roses, it’s like picking a favorite child. So this time we chose three! This, the first that we’re releasing in 2018, is the 7th that we’ve purchased from the distillery, It’s an OESV, meaning it has a high corn content (and lower rye content than other Four Roses recipes) and it utilizes their proprietary “Delicate Fruit” yeast strain. Oh, it’s also 10 years and 6 months old, which means it has a well-integrated toasty, oaky flavor that you can only get from barrels that have been carefully aged for a loooong time. Toasty & tasty. We were drawn in by the aroma of baking cocoa and toast, but fell in love with the long, dry finish. There’s a little nuttiness in there, too. This is a civilized bourbon for the connoisseur and novice alike. Wants nothing more than a bit of cool water to temper the heat. We’re always happy to bring in a barrel of Knob Creek. It’s guaranteed to be at least nine years old, it’s always 120 proof, and it’s always very well priced. It’s not easy to find bourbon this good, this old, anymore. But here you go. This particular bottle was filled in February 2008 (making it 10 years old!) on the 3rd tier of the 4th floor of warehouse “E”. This means it was right smack-dab in the middle, the sweet spot where bourbon doesn’t age too quickly and hot, or to slowly and cool. Hot & uncompromising. We don’t know if you can handle this bourbon. It’s like getting socked in the mouth with a nerf ball steeped in bourbon, caramel, dried fruit & more bourbon. Add a cube or a splash of water to get that classic Knob Creek flavor of fruity, oaky, bourbon. Also great for robust cocktails, like a Reanimator or Boulevardier. Dan is our new spirits buyer, and one of his first duties was to help us select the first private barrel of Knob Creek Rye to come into Rhode Island. It’s a tough job, but someone’s gotta do it. This is a relatively new program of Knob Creek, so the barrels aren’t quite as old as we get for bourbon, but rye’s brash flavor more than makes up for its youth. This barrel was filled in November 2011 and aged at the very tippity top of warehouse “Z”. That’s where things get the hottest, and traditionally where the whiskey evaporates and concentrates the quickest. Spicy & warming. You’ll find in-your-face grainy rye flavor with a pleasant char and long, throat-warming finish. Makes a killer Old Fashioned. Good job, Dan! It’s here – the first Maker’s Mark Private Select in the State of Rhode Island! Maker’s private barrel process is an unusual one: we were given the chance to customize the barrel in which our bourbon would spend the final stage of the aging process by choosing from a menu of distinct oak staves, each with its own name, and each adding flavor and nuance to the finished product. After several hours of sampling different combinations, we went with a recipe that used the “Toasted French Spice” and the creamy “Seared French Cuvee,” with some “Toasted Oak” and a pinch of “Mocha” staves. The bourbon was put into our barrel, then allowed to mellow in a very cool warehouse. We’re thrilled with the final result: it’s dangerously drinkable for something that’s 112 proof. We hand-signed every label, and may have left some secret messages on the back! Unique & confectionary. There is, quite literally, no other Maker’s Mark like this in the world. Full of rich cocoa and mocha flavors, with a healthy dose of cinnamon and clove. Deceptively smooth and drinkable for such a high proof! This is incredibly rare. A hand-selected, six-and-a-half year old barrel of the coveted Weller, a wheated bourbon much in demand. This one is going fast, so in an effort to spread as much love as we can, we’re putting a cap on the number of bottles one can purchase. It’s great liquid at an amazing price. There’s nothing more to say. It’s Weller. Enjoy! This is very exciting for us whisk(e)y geeks at Bottles. Compass Box is one of our absolute favorite producers. Great King Street Artist’s Blend is their entry-level whisky, made up of a specific blend of whiskies and “marrying casks.” What you have here, though, is a limited release of a single “marrying cask.” We purchased the entirety of one French Oak cask, the one that adds ALL of the rich baking spice flavors and creamy texture to the final blended product. This single cask is rich, bold, and full of comforting baking spice flavors. 100% Highland Scottish Single Malt matured for 2 years in a custom French Oak cask. It’s single malt on steroids. This is the perfect dram for a cold winter’s evening (or day). Grab one for the Scotch lover in your life, grab two for you! For more coverage of our Private Barrel Program, be sure to check out last year’s additions. For pricing and availability on all of our selections, visit us in store or speak to one of our team members by calling (401) 372-2030. This entry was posted in Learn About Spirits and tagged bourbon, malt, private, private barrel, rye, single cask on November 13, 2018 by bottlesfinewine. To say our team is obsessed with picking out the perfect wine to take home to our family and friends on Thanksgiving Day is an understatement. The options are almost too plentiful to manage, and the pressure to find the bottle that’ll please opinionated Aunt Olivia and finicky Uncle Phil is on. Months are spent on this quest. Months. But we’re happy to do it – it’s wine after all! Here’s what our epic obsession has led to this Thanksgiving of 2018. We think you’ll find something that’ll make you, too, the hero of the table. As if the bottle isn’t gorgeous enough, this rosé is also delicious. Made from Cabernet Franc grapes  grown in Chinon, it has subtle herbaceous notes of rosemary  and parsley with juicy raspberries in the forefront. This is such a treat to enjoy with a big feast and all the fixings! Spoil your friends and loved ones with this  special bottle. This entry was posted in Other on November 6, 2018 by bottlesfinewine.